Autofluorescence images, which are obtained through the use of confocal laser scanning ophthalmoscopy (cSLO), are playing an increasing role in the understanding of drusen and age-related macular degeneration (AMD). An example of a typical, unfiltered autofluorescence image in a normal retina can be seen in Figure 1. Autofluorescence (AF) images are derived largely from lipofuscin accumulated in the retinal pigment epithelium (RPE).1,2 It is believed that metabolic activity of the RPE correlates with the content of lipofuscin in RPE cells.3 In humans, lipofuscin accumulates with age within the lysosomal compartment.4 Excessive lipofuscin accumulation in the RPE, as imaged by focally increased autofluorescence (FIAF), has been proposed to be a marker of RPE disease and photoreceptor cell degeneration.5,6 Focally decreased autofluorescence (FDAF), especially over larger areas, is equivalent to geographic atrophy (GA).7 These correlations between macular pathological states and AF imaging indicate that a better understanding and ability to analyze these images can help in the staging and treatment of AMD. Figure 1. Typical Unfiltered AF Image of a Normal Retina. AF photo of a 50-year-old woman taken by SLO at a resolution of 512 pixels square. The circle encloses the central foveal region of interest (1500 microns squared or 100 pixels squared). This region is hypofluorescent (darker) in the center and becomes progressively hyperfluorescent (lighter) away from the center. 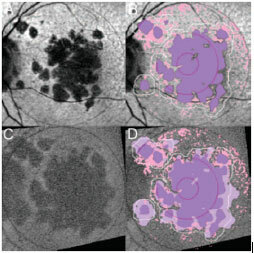 (A) Right eye of a 54-year-old woman showing significant background variability and foveal decreased fluorescence due largely to luteal pigment. (B) Twelve-zone mathematical model of the AF background in (A), presented as a contour graph. Note how the model captures the background variability of the original scan. (C) The image in (A) leveled by subtracting the model in (B). The background of the leveled image is now homogenous. Increased autofluorescence was defined as 2.0 standard deviations above the mean, and can be shown in pink. Comparison of the increased FAF with the original image (A) demonstrates a very reasonable selection. By contrast, the use of any single threshold in the unleveled image (A) to define increased FAF would cause major errors, due to the image variability. For the additional concern of images in which there are areas of GA, we developed a semi-automated method of GA segmentation in which the health care provider can draw the area of GA rather than to label the area manually, as can be seen in Figure 3. We incorporated this technique in the analysis of serial images from patients by registering the images on computer software (Matlab 7.0; The Mathworks, Inc., Natick, MA).12 In Figure 4, the application of these techniques to AF images from a patient obtained at an initial visit and another visit 3 years afterwards are shown. There is limited overlap of the areas of FIAF over the areas of newly-developed GA.
On the far left, one can see an AF image with an area of GA. In the center image, using the automated GA segmentation tool, the user demarcates the background and the areas of GA with a few simple lines. On the right, the software finds areas of GA (compare to original AF image on the far left). (A) Initial AF image. (B) Segmentation into GA (purple) with border zone outline (white), and increased FAF (pink). The increased FAF was defined as 1.5 standard deviations above the leveled image mean for this illustration. (C) Final AF image, 3 years later. The image is of only fair quality, but the GA is defined adequately. Note how the image has been stretched and rotated by the registration software to align with the initial image in (A). (D) The total GA is composed of new GA (light purple) and original GA (dark purple). The original increased FAF (pink) in (B) is superimposed. Figure 5. Comparison of Soft Drusen Only to Soft Drusen and GA.
(A-E) An eye with soft drusen only. (F-J) An eye with soft drusen whose fellow eye has GA. (A, F) Fundus photographs were cropped to the 3000-micron region. (B, G) Drusen was segmented (green) using the automated leveling and thresholding software. (C, H) The corresponding AF images, which were registered with their respective fundus photographs. (D, I) Segmentation (pink) of areas of FIAF. (E, J) Areas of co-localization can be seen in black, with more overlap occurring in the eye of the patient with only soft drusen (E) rather than the eye of the patient with GA in the fellow eye and some atrophic changes in the pictured eye (J). Since reticular findings were first noted on blue channel fundus photographs,14 it has been postulated that there may be significant under-reporting of RPD given the more common use of color fundus photography without the added green or blue channel photos.17 As such, it has become increasingly important to use more than one imaging modality when evaluating patients for these lesions in the setting of AMD. The use of AF in the imaging of RPD began with the identification of a reticular subtype of AF images characterized as a grouping of ill-defined hypofluorescent lesions against a background of mildly elevated AF.20 These reticular findings on AF were subsequently linked to RPD through the use of our exact image registration techniques, an example of which can be seen in Figure 6, which shows a side-by-side comparison of color fundus and AF images for one of our study patients.13 Through the methods for automated image analysis described earlier, we were able to find a strong correlation between RPD as noted on color fundus photographs of study patients and findings of reticular AF in such patients, with only two patients who had reticular findings on color fundus photos without reticular AF patterns. (A, D) Original color photographs of right and left eyes of a patient with unilateral CNV. The reticular pseudodrusen are difficult to appreciate. Optic disc drusen were also present incidentally. (B, E) The photographs were contrast-enhanced for better visualization of the reticular pseudodrusen. They were present in all quadrants (E) and above the optic nerve (B). (C, F) Corresponding AF images. The optic disc drusen showed characteristic hyperautofluorescence. Reticular AF was present above the optic nerve (C) and was also present in all quadrants (F). Hence, in both eyes, the damage demonstrated by reticular AF corresponded very closely to that suggested by the reticular pseudodrusen in the photographs. 2. von Ruckmann, A. et al. In vivo fundus autofluorescence in macular dystrophies. Arch Ophthalmol 1997; 36:718-729. 3. Kitigawa, K. et al. In vivo quantification of autofluorescence in human retinal pigment epithelium. Ophthalmologica 1989; 199:116-121. 4. Weiter, J.J. et al. Retinal pigment epithelial lipofuscin and melanin and choroidal melanin in human eye. Invest Ophthalmol Vis Sci 1986; 27:145-152. 5. Delori, F.C. et al. Autofluorescence distribution associated with drusen in age-related macular degeneration. Invest Ophthalmol Vis Sci 2000; 41:496-504. 6. Dorey, C. et al. Cell loss in the ageing retina: relationship to lipofuscin accumulation and macular degeneration. Invest Ophthalmol Vis Sci 1989; 30:1691-1699. 7. Holz, F.G. et al. 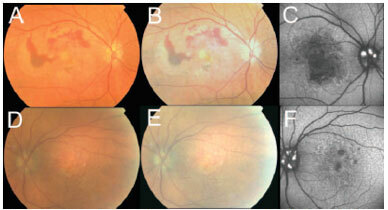 Fundus autofluorescence and development of geographic atrophy in age-related macular degeneration. Invest Ophthalmol Vis Sci 2001; 42:1051-1056. 8. Smith, R.T. et al. A method of drusen measurement based on reconstruction of fundus reflectance. Br J Ophthalmol 2005; 89:87-91. 9. Smith, R.T. et al. Automated detection of macular drusen using geometric background leveling and threshold selection. Arch Ophthalmol 2005; 123:200-207. 10. Smith, R.T. et al. A method of drusen measurement based on the geometry of fundus reflectance. BioMed Eng Online 2003; 2:10. 11. Smith, R.T. et al. Autofluorescence characteristics of normal foveas and reconstruction of foveal reflectance. Br J Ophthalmol 2005; 89:87-91. 12. Hwang, J.C. et al. Predictive value of fundus autofluorescence for development of geographic atrophy in age-related macular degeneration. Invest Ophthal Vis Sci 2006; 47:2655-2661. 13. Smith, R.T. et al. Autofluorescence characteristics of early, atrophic, and high-risk fellow eyes in age-related macular degeneration. Invest Ophthalmol Vis Sci 2006; 47(12):5495-5504. 14. Mimoun, G. et al. Macular drusen. J Fr Ophthalmol 1990; 13:511-530. 15. Klein, R. et al. The Wisconsin Age-Related Maculopathy Grading System. Ophthalmology 1991; 98:1128-1134. 16. Arnold, J. et al. 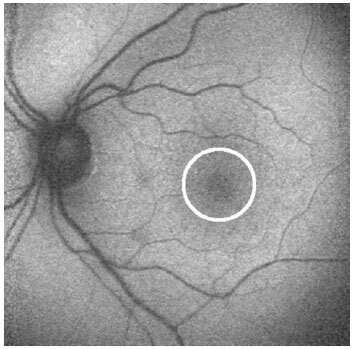 Reticular pseudodrusen: a risk factor in age-related maculopathy. Retina 1995; 15:183-191. 17. Klein, R. et al. The epidemiology of retinal reticular drusen. Am J Ophthalmol 2008; 145:317-326.